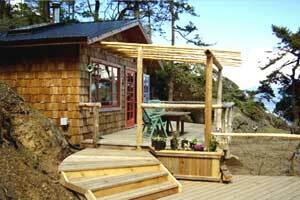 The Bed and Breakfast is a small, rustic, newly built, self-contained cabin situated on a rocky bluff overlooking the Strait of Georgia. It has a simple, colourful, artistic design, and is partially-built with reclaimed beach-combed cedar and is powered by renewable energy. "West Coast, Wild and Exotic"
The Bed and Breakfast is surrounded by Squitty Bay Provincial Marine Park with its many hikes, deserted bays, first-growth juniper forest, cacti, wildflowers and free-range ferial sheep. This unspoiled paradise is a delight to the senses that inspires awe and demands respect. A basic breakfast of farm fresh eggs, home made bread, fruit, coffee and tea is provided.